Or, come down to the Native Friendship Centre (2001 St-Laurent, corner of Ontario) to participate - free food and coffee all night long! What is the Homelessness Marathon? 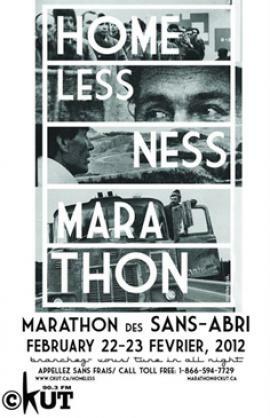 Every year, the Homeless Marathon serves up 14 hours of people-powered radio, broadcasted on nearly 40 radio stations across Canada. With the goal of being a consciousness-raising event, the Marathon will provide an opportunity for homeless people and their allies to take to the airwaves, and allow a nationwide discussion on homelessness issues and possible solutions. Other hourly topics and panels on gender and access to housing, police repression and the law, art in the streets, migration and housing, and more! Segments of the marathon also being hosted live from the streets of Halifax by CKDU radio, and the streets of Vancouver by CJSF radio!